Lilian Biggs founded the BDIYI and was hugely influential in establishing Iyengar Yoga across our district. She was born on the 20th September 1925, champion cyclist, expert ballroom dancer, great grand-mother and yoga teacher extraordinaire. She became an Iyengar teacher in 1974 and obtained her senior certificate in 1981. She had been to Pune to attend Mr Iyengar’s and Geeta’s classes 18 times. Lilian introduced thousands of people to yoga, she has also trained over 50 teachers, and has trained others to become trainers of teachers. She served her time as a moderator and an assessor and for many years has been running residential weekends in Yorkshire. She has taught abroad as well as at many national and regional events. Lilian has also contributed hundreds and hundreds of unpaid hours over the year to building the Iyengar Yoga Association. It is heartening to hear that you are all celebrating the 80th Birthday of Lilian Biggs. A very devoted student of yoga since the day she embraced it and I am sure her energy is enough for you all to embrace the subject with more vigour. A fine lady is celebrating her 1,000 full moon sight. Please convey her our best wishes and may God bless her to live a full 100 years. Those of us who have been Lilian’s regular students have been so lucky. Over the years she never seemed to change, bringing limitless enthusiasm and energy to her teaching. Every week she shared her knowledge and experiences learned directly from Mr. Iyengar’s teaching. Lilian had the extraordinary ability to get so much more out of us than we ever thought possible and the insight to see our potential long before we could. Somehow, she instilled in us a determination to try harder and go further without it being obvious and we always responded. She leaves a gap that can never be filled but her unfailing dedication to promote Mr. Iyengar’s teaching will stay with us. Her integrity and modesty were an example for us all. Her ability to spot a mistake from the far corner of the room and her instant understanding of how to correct it will be imprinted on my mind. Although Lilian is no longer with us her spirit, her love of Yoga and her students will live on in all she touched and I hope we can share a little of that with those whose lives we touch too. Lilian was my first yoga teacher. I can still remember the first time I met her and the look she gave, sizing me up, as I signed on for my first yoga class 26 years ago. I think even at that point I knew she was going to play an important part in my life. She could be incredibly blunt; I recall one student describing their first encounter with Lilian as being savaged by a sweet little old lady! She was a devoted disciple of BKS Iyengar and stuck faithfully to his method. Lilian was full of warmth and compassion and wonderfully down to earth. A wry sense of humour and inexhaustible supply of anecdotes, combined with an infectious enthusiasm for yoga made her an extremely popular teacher with a large following. That popularity also resulted from her great passion for yoga and considerable knowledge and experience built up over many years with 18 visits to Pune. She was a determined and hardworking yoga practitioner with a seemingly inexhaustible supply of energy and right up to the time of her death she was still taking 6 classes a week as well as teaching all over the country most weekends. These qualities meant that she became something of an institution in the Iyengar Yoga world, being regarded as almost super-human by some. Her sudden and unexpected death painfully reminded us all that this was not the case. 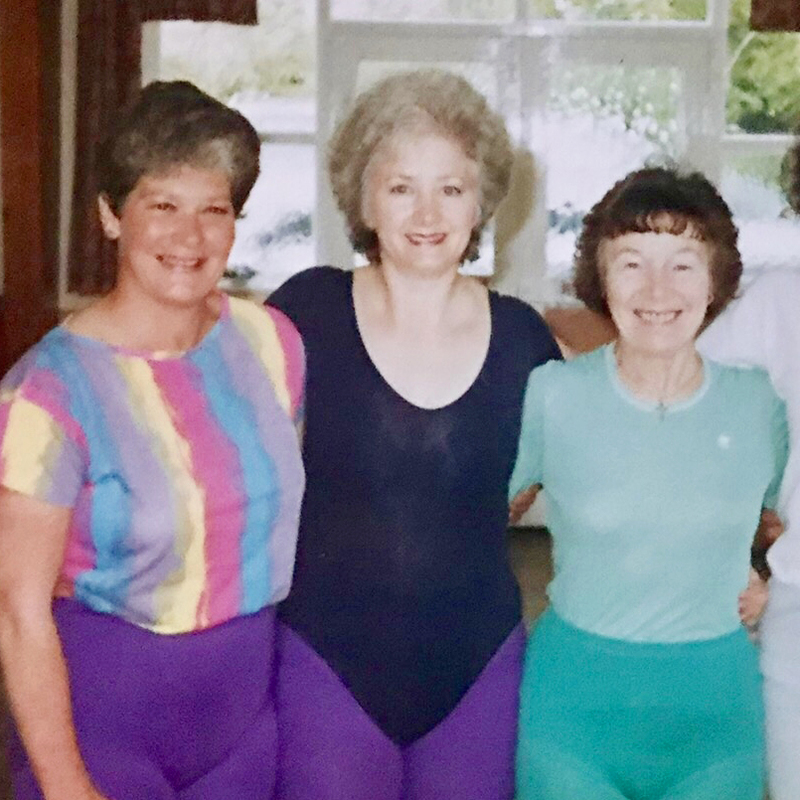 Some of you will know that Bradford and District Iyengar Yoga celebrated Lilian Biggs 80th birthday with a ‘This is your Life’ party at the Midland Hotel in Bradford on Saturday 1 October 2005. The word ‘inspirational’ was used time and time again at the celebration, by those who attended her funeral and by the numerous people who feel her loss. For me the three outstanding qualities that Lilian possessed that made her so inspirational to me were, first, her strength and courage - both in her personal life bringing up 5 children after the sudden early death of her husband and in her yogic life, going to India in the 1970’s to learn from Mr Iyengar. Secondly, her humility. Lilian in her teaching would often say - ‘these are Iyengar’s own words’ but we all knew that Lilian had worked hard to translate those words into understanding so that she could inspire everyone that she met - not just taught. Lilian also took great delight in the achievements of her students - but those of us who she taught knew that the achievements were due in part to her inspirational teaching and constant support. And finally, but perhaps most important her fun and joy in life - when I write of her now although I am sad but I have to smile - because Lilian made one smile - even in the most difficult of postures. Dear Lilian, I’m writing to let you know that we miss you, and how! We miss your sense of humour, optimism, and positive attitude, And we miss too, your knowledge and fortitude. We thank you for bringing Iyengar Yoga to our neck of the woods, The mats, belts, blocks and books. You’ve treated us all as one of your own, And the legacy you’ve left behind, we shall follow from flesh ‘t’bone. The day you left us for another place, Well, we’re still distraught, bereft, and long to see your face, But rest assured and in peace---- That you’ve left us united, strong, and at ease. The classes will continue, tho’ you’re a tough act to follow, As just at the moment, we’re feeling so so hollow------- But as you’ve so often said, ”come on!! you need to get on”! So we’re getting up and moving on! You’ve been my teacher for 31years, Accentuating the positive, and allaying my fears, I can hear your voice, as I practise, ringing in my ears------- Lift here, press there open this, as you’ve instructed over the years!! And so, dear Lilian, I send you my love, and good bye The last word…. Many of us involved in the BDIYI owe Lilian a great debt of gratitude for all that she contributed and inspiring us on our yogic journey. Her legacy lives on through her teachers and students and her imprint is still strongly felt today.